Here are two new rules about PR that may spin your understanding of the media game around. First, it’s not about you. Second, chances are you’re incredibly boring. Between that rock and a hard place is a big territory filled with opportunities for getting media coverage. And here’s a third new rule: you don’t need a big firm to get PR. 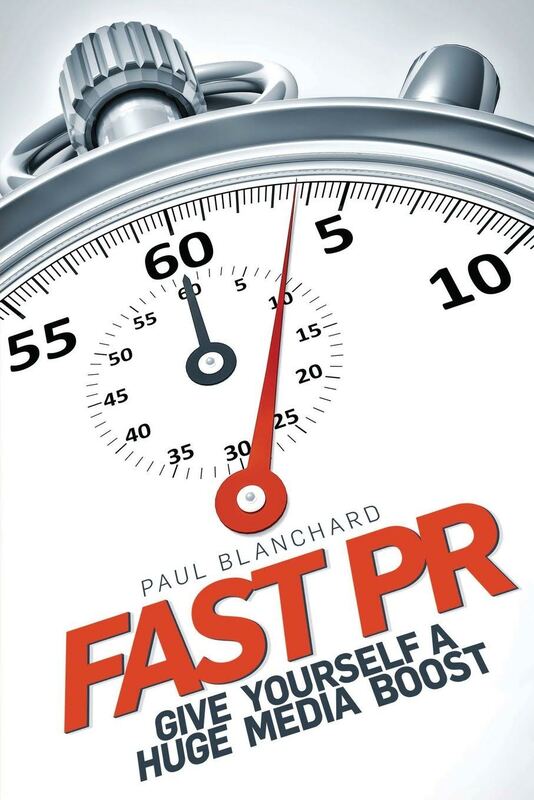 Essentially, you just need Fast PR: Give Yourself a Huge Media Boost, a new book by media expert Paul Blanchard. The challenge for most of us is how to garner press coverage for what we do, sell, create, or otherwise parlay into a business. We’re all trying to get noticed. But we tend to be clueless as to how to go about it. Should a legacy men’s shoe brand care about social media? How do you write a press release, or should you even try? Smart, to the point, and as candid as a good friend offering advice over a beer, Blanchard can tell you. He’s been around the PR block more times than most, but has lost none of his enthusiasm for the media game. He has, on the other hand, developed a healthy cynicism for wrong-headed approaches to PR along the way — and inspired by bad PR tactics as well as his own adventures in the trade, he set about to write a colorful, crisp guide to going it right. Blanchard is eminently qualified to do this: His firm, Right Angles, is a high-touch, high-intensity PR firm that does personal and company PR for major clients from politicians to CEOs, billionaires, industry leaders, philanthropists and entrepreneurs. It also does a good deal of damage control: if a client is mired in a PR crisis, someone has to get them out. You might say Blanchard and his team are like the Navy Seals of the business. And in his time off, he talks with other media masters — in a podcast of the same name. Often, for some reason, these normally close-to-the-vest types divulge all manner of insider wisdom. And sensibly, Blanchard includes nuggets from that show in the book, making it a clear lesson in the value of cross-purposing content. Blanchard’s tips take on a third, real-life dimension when these insights, are added so you do actually get the sense that you are receiving top-shelf guidance based on years and years of experience — all for the price of a book. There are 107 topics in all, organized into 20 well-defined sections covering everything from how to write that press release (or not) to cultivating relationships with journalists, writing great blog posts, tweeting appropriately, making compelling videos, and protecting your reputation during a crisis. At the end is a bonus “Jargon Buster,” a wry and helpful lexicon of common PR terms. It’s packed with attitude, but still tells you exactly what you need to know — which, after all, is just what you need. There’s a refreshing blend of old-school savvy and very 21st century social media awareness in this book, which makes it relevant for everyone from Gen Z to Baby Boomers. As Blanchard points out, this is an era when information moves as fast as a tweet. News cycles are 24 hours a day and seven days a week, and it’s really not enough to be a mere expert and expect people to come to you — you have to get out there, tell your own story, make it compelling and real, have conversations and exchanges with like-minded colleagues, and get yourself out there. With Fast PR, you’ll learn how. Yes, you can do this yourself — and given the credentials of its author, you might actually have the advantage.